We go away for the weekend about once a month when the weather is warm. Packing for these little getaways was once a frustrating chore for me, but after a few trips, I realized that I was taking too much. Now that I have streamlined my travel wardrobe, I can pack in five minutes. I always wear a comfortable pair of dark pants for travel with a jacket or cardigan and a light colored plain top that I can wear without the third piece. I am not a skirt or dress fan, so I only include pants. In my small carryon size rolling bag, I packed one light and one dark pair of pants as well as one lightweight and light color long sleeve blouse. The second pair of pants was a white pair of jeans, and the third was the navy crepe pants from my site. 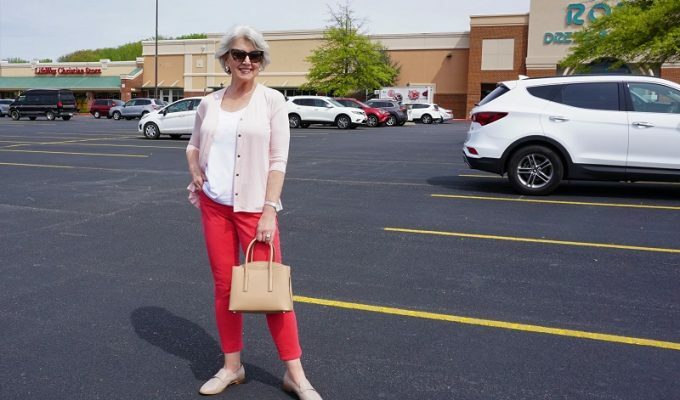 I also took a white cotton cardigan, a gray tank, another white shell, and the three-quarter sleeve navy top from my site to match the pants. I included two pairs of shoes, one dressy for dinner and a comfortable pair for walking. 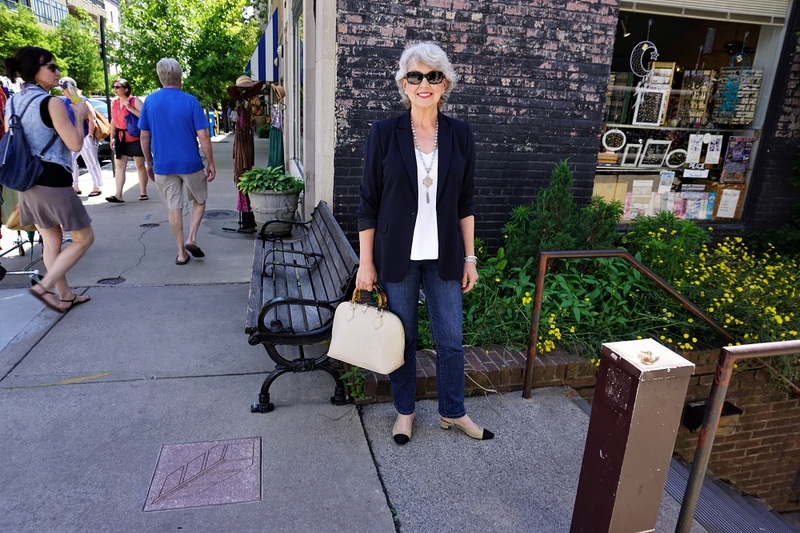 A blue, white, black and gray print summer silk scarf and two necklaces were my accessories. As always, I will recap the outfits at the end of the week and show you how I wore the combinations according to what we were doing. Our most recent weekend getaway began the month of celebrations for Mr. Mickey’s eighty-fourth birthday. (After the age of eighty, you can celebrate for the whole month!) We were expecting some rain and cool weather during our trip to Highlands, North Carolina. 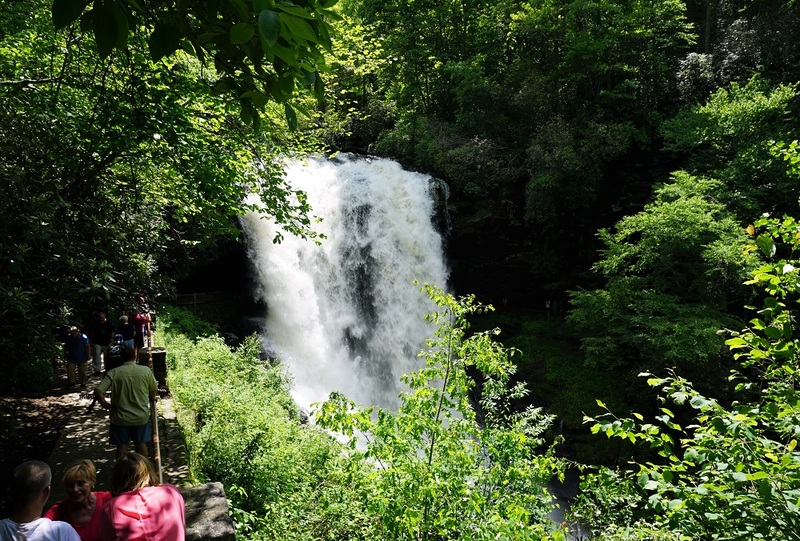 More than twenty-four inches of rain fell in that area during May. Susan, great outfits. What is the beautiful bag you are carrying in the pictures? That BCBG bag is at least three years old. I bought it at T.J.Maxx. Great outfit for travel–pretty and practical! Looking forward to the week’s outfits as they develop. I was born in Asheville but have visited there only at intervals (long complicated life story) and remember it as a rather seedy sleepy place way back then, reviving more recently into a truly happening place with lovely restorations. I wish I had appreciated all the Art Deco details when I was younger. I always enjoy your visits there and try to look for familiar elements in your street shots. Your approach to dressing for travel resembles mine. After many journeys after which I inevitably unpacked things I had not worn, I learned that less is truly more. I will be interested to see how you apply that wisdom this week. Can’t believe Mr Mickey is 84! Looking fantastic at this milestone. Thank you for this! We are about to take a 7day cruise in Canada and I always over pack. This blog is very helpful. Sue Manzo – I will be doing a cruise from Boston to Montreal in July and I’m loving Susan’s tips here as well as I overpack too. Enjoy your cruise. Hi Susan, thank you for the packing tips as well as how to look sharp while traveling. The blazer you are wearing is probably not new; however, do you know where to find one that is summer weight? Mine are all for warm weather. Happy Birthday to Mr. Mickey! Pat D.
I ordered a French Kande necklace I had admired on you, and I just love it! Since I am only 5’2″, I took it to my local jeweler and they removed some of the links to make it the “just right” length on me. A simple fix that cost me nothing. Thought some of your shorter readers might like this info. French Kande will also be happy to send you a necklace with a shorter chain. Thank you for the reminder, Cheryl. I hope you enjoy the jewelry for many years to come. Thank you, I didn’t realize that. It was from Neiman Marcus Last Call a couple of years ago. Happy Birthday to Mr. Mickey!! I always either over-pack or under-pack … I never seem to get it right LOL. Please wish Mr. Mickey a very happy, healthy birthday for me. I think many of us would love to know how you met and more about you if you are comfortable sharing that info. Downsizing from a large 5 bedroom home tells me you are divorced and might have a child or two. Please share if you care to. Mr. Mickey and I met at neighborhood Christmas party twelve years ago. I am divorced, but that was more than twenty years ago, and I have no children. I bought the large house because I kept my jewelry supply business in my home for as long as I could. About six years ago, the company had grown so much that I had to let it leave the nest. I bought a four thousand square foot building in the industrial park to give the business room to continue to grow. Love reading your blog and always check to see your latest post! Mr. Mickey is amazing! I think you and he must keep each other young! Happy Celebrating! 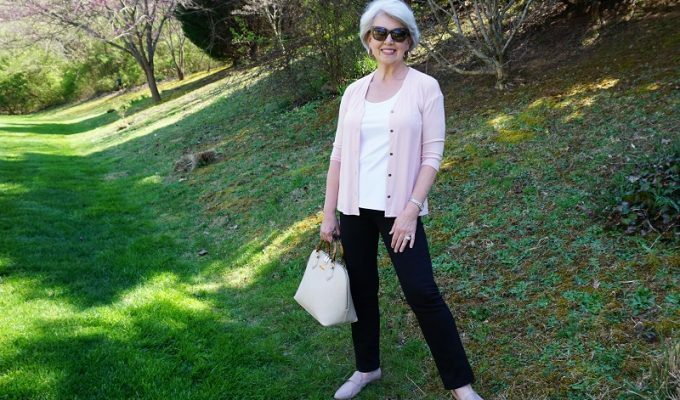 I love the casual 3/4 sleeve navy cardigan you are wearing n the the “Packing for Weekend” blog. You state it is on your site, but I don’t see it. A Tahari navy blazer with the sleeve pushed up is pictured in this post. I will show the 3/4 sleeve crepe top in another post and then recap all the items with a full list of sources in another post. The top is here. Susan I need help in finding a white cardigan sweater! Can’t seem to find one that works. I bought a couple of white cardigans at Cali and York last year. It is essential to find one that is mostly cotton and machine washable. I throw mine in the wash often to keep them bright and fresh. Try Old Navy, J.Crew, or J.Jill, and there are several styles of them offered at Nordstrom. Wow 84 I thought he was in his 60’s or early 70’S . He looks down right fantastic. Looking forward to seeing a video on your weekend travel wardrobe in a carryon. I am not a fan of preparing for overnights. Inevitably I leave something behind. So am grateful to see other peoples ideas on packing. The waterfall was beautiful! Thanks for sharing. Happy Birthday to Mr Mickey! He is the epitome of a true gentleman and I love his elegance. I’m with you on preparing for the AC. We always freeze in restaurants especially in the summer. Love your weekend travel suggestions. Why is it that we prepare better for long vacations than short weekenders? You always have lovely outfits. Do you ever go swimming? I have the hardest time finding cute swimwear with enough covered for this 63 yr old body. Any suggestions?? The suit I have is by RubyRibbon.com. I rarely wear or have a need for a swimsuit. Susan love the shoes..its hard to find really cute shoes for me..lol I have big feet..always said God knew I would need a big foundation to hold me up. Great packing tips. I always pack too much. The falls look beautiful. I may need to visit someday. Mr. Mickey does not look 84. I guess you’re keeping him young, eh!! ?